Protein powder has always seemed foreign to me. I remember working at a smoothie bar (which is so not as fun as it sounds, BTW) and trying it a few times, thinking it just tasted like chalk! We’re always told we need more protein, and that’s true, especially if you don’t consume a lot of nuts, eggs, meats and fish. Protein powders have come a long way since their chalk-like days, and as vegetables are increasingly looked to as a good source of protein, there are more plant-based options on the market (good news for vegans!). Most people don’t need protein powder, but if you’re consistently falling short on your protein intake, are active or exercise a lot, or need an on-the-go protein option, protein powder can be great to keep on hand. You’ve probably seen muscly dudes at the gym or the health-food store stocking up on whey protein. It has a reputation for being popular with body-builders, and that’s because it’s a quick source of energy that’s especially helpful right before or after a workout. Whey protein helps build muscle by promoting the growth of lean tissue mass. Meanwhile, studies have also shown that it can help reduce body fat. However, those with any sort of milk allergy risk a reaction with whey powder. If your goal isn’t to build muscle and lose body fat, it might not be right for you; if it is, look for a whey protein powder with at least 50% protein. Casein is the other protein found in milk. It has similar nutritional effects, but is slower-digesting than whey. With casein, the amino acids stay intact and don’t break down as much, keeping you full and energized (without the spike that whey has) for longer. While whey is ideal for right before or after a workout, you’ll still need to consume some protein an hour so after taking it. Casein is ideal when you know you won’t eat for a while. You can also combine casein and whey protein powders (or keep both on hand) to complement each other. Egg white protein is also available, but it’s not as common anymore due to its…unique taste. Soy, rice, pea, and hemp based protein powders are also becoming more popular, as not everyone wants or needs a milk-derived protein powder. Soy and hemp protein have the benefit of providing all the essential amino acids. Often these will include sprouted ingredients and whole foods like brown rice, quinoa, millet, spirulina and chia. (If you’re gluten free, make sure to check what grains are used.) 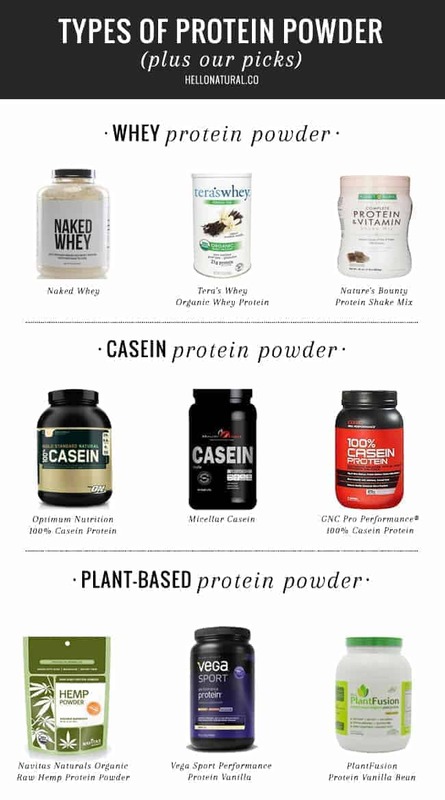 PopSugar has a roundup of plant-based protein powders. Great info, thanks for the post. I used to drink a daily soy based protein shake and was later told by my oncology doctor at Moores Cancer Center in La Jolla CA that soy can contribute to breast cancer. I wanted to pass it along to others who are clearly health foodies like me. Thanks for this information! I use Whey protein and don’t know too much about other kinds, so this was a nice and interesting read!